Yaakov Hagoel of the World Zionist Organization warns of increased anti-Semitism throughout Europe. 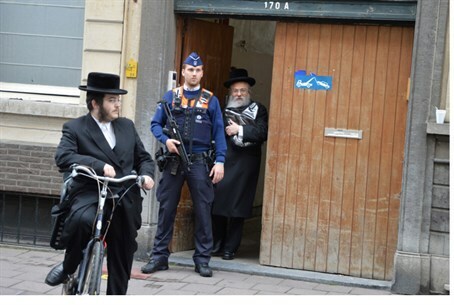 Yaakov Hagoel, head of the Department for Combating Anti-Semitism at the World Zionist Organization, told Arutz Sheva on Sunday that he was not surprised by the stabbing of a Jewish man in Antwerp. "Unfortunately, we are receiving reports about incidents such as this all the time,” he said, noting that there has been a substantial increase in violent anti-Semitic incidents in Belgium. He stressed that he was not talking about graffiti and other similar incidents, but rather about real violence against Jews. As to how to fight the phenomenon, Hagoel noted that the main objective is to raise public awareness. “People close their eyes and bury their heads in the sand. We are told by community leaders they life can go on as usual,” he said. "The Israeli government and the Jewish Agency are trying to strengthen the Jewish communities around the world and raise their spirits but we are in a difficult time period," added Hagoel, adding that there is a problem with some of parliaments in Europe, where anti-Semitic parties have gained power. At the same time, Hagoel told Arutz Sheva, “The glass is also half-full”. An example of this, he said, can be found in France, where the government has taken charge ever since the 2012 attack in Toulouse.